Pizza is a unique experience but we all experience it differently. We grew up on New York style thin crust which is similar to Naples pizza (the original pizza). Chicago pizza is different with its thicker crust but also good. California pizza experiments with different toppings like pineapple (not our style). Pizzeria Brandi is suppose to be the original pizza in Naples. It is located at Salita S. Anna di Palazzo, 1-2, 80132 Naples, Italy. The Margherita Pizza was for the queen. It had the three colors of the Italian flag (Red the tomato sauce, White the mozzarella cheese and Green the basil). It was the original street food. It was folded twice and held with a napkin and eaten as you walked. Today pizzas in Italy are always individual and un-sliced. You eat them with a fork and knife. Pizza can be very different in different parts of Italy. In the north (Milano) it is thin crust with imaginative toppings and very good. In Roma it is thin cracker crust pizza that we don’t care for. 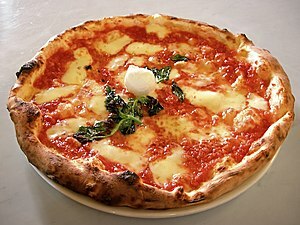 In the south it’s Neapolitan (from Naples) pizza which is what most thin-crust pizza in America is fashioned after. Here they do thin crust, margarita style pizza with buffalo mozzarella. YUM! Where ever you get it, the Italians use only fresh ingredients that smell fantastic and taste molto buono. Don’t forget a glass of great Italian Vino with your favorite pie!